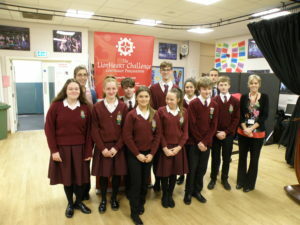 Year 10 pupils took part in the Lionheart Enterprise Challenge. The pupils worked in teams of ten with the direct guidance and support of the Lionheart Business coaches to develop, market and cost a service to support a local citizen group. Two pupils from each team then presented their team’s idea to the rest of the year group. The teams were judged following very strict criteria by Mrs Smith, Mrs Murray and Mr Hankin. The winning team will now go on to represent OLCHS at the national final of the competition next spring.